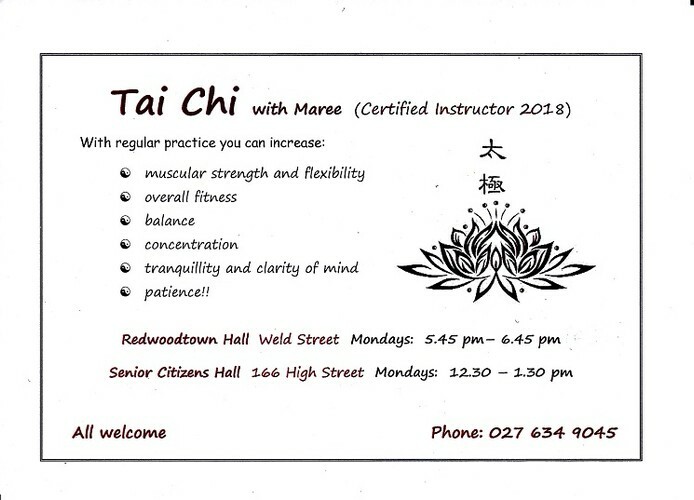 Welcome to Tai Chi classes with Maree! Tai Chi is great for both the mind and body - with regular practice you will be able to improve your physical health and develop tranquility and inner balance. I am a certified instructor with the Tai Chi for Health Institute in Australia (https://taichiforhealthinstitute.org/). My classes are open to all ages, levels of physical ability and experience. No special attire needed - just throw on some comfy clothes and flat shoes and come along and try it out. Please phone 027 634 9045 for more information.